This summer, we celebrate the 4th anniversary of the Bike Repair Hub by doubling its open hours and debuting a Build-A-Bike program. Check out our new stop-motion video about the Bike Repair Hub and support our work through our Indiegogo campaign today. 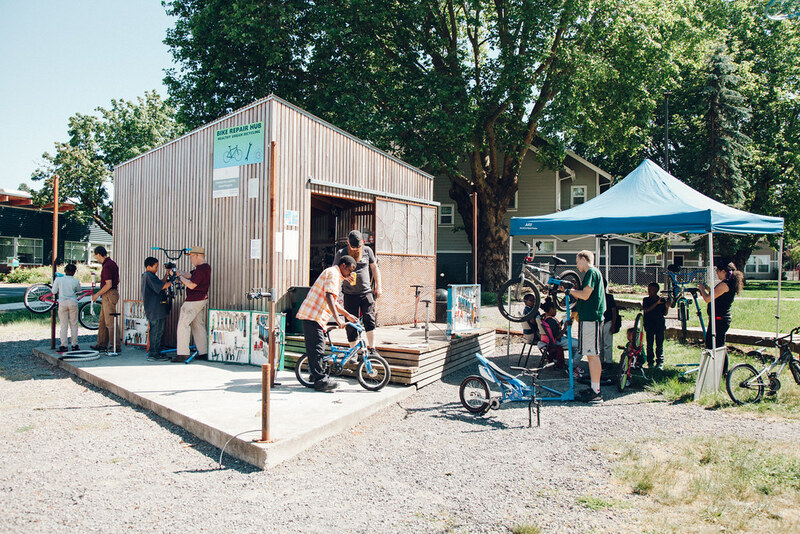 In 2010, the Community Cycling Center asked neighbors in New Columbia, an affordable housing community in North Portland’s Portsmouth neighborhood, what barriers they faced to riding bicycles. As the interest in bicycling grew in the neighborhood, it became clear that there was a great need for basic bike repair. Back then, New Columbia was located in a bike shop desert, with no access to bike repair resources nearby. The residents dreamed of having a space where they could store tools, bicycle parts, and equipment, while helping community members fix their flats. From this idea the concept of a Bike Repair Hub was born. So in 2012, the Community Cycling Center transformed a vacant lot into a vibrant space for neighbors in New Columbia to learn, connect, and ride. Since then, over 2,000 people have visited the Bike Repair Hub, with over 1,000 bicycles receiving bike repairs. We complete an average of 50 free bike repairs each week at the Bike Repair Hub. The Bike Repair Hub is now open two days a week, providing free drop-in bike repair services to the neighborhood. Our mechanics lead bike maintenance lessons for people that want to learn bike repair skills. In turn, they can volunteer and help their friends and neighbors fix their bikes. As soon as the doors are opened at the Bike Repair Hub, children come from all over the neighborhood to help each other fix their bikes. The Bike Repair Hub also serves as a meeting point for bike rides and site of our new Build-a-Bike program, where residents can learn how to build their very own bicycle. Learn more about how you can support the Bike Repair Hub at our Indiegogo campaign site.